For those of you who follow my admittedly sporadic blog, you have probably noticed that my family moves a lot. We always hope we'll settle where we land, but so far that hasn't happened. Since I got married I've moved from Cambridge to Yorkshire to Connecticut to New York City to Cumbria to the Cotswolds to Wales. Whew! Starting over isn't easy, even when you're used to it. My children have all been in school a week and that feels like a relief. They are starting to know their way around and have made a few friends. The worst, I hope, is over. One nice thing about living in lots of places is the inspiration I've found in each one. 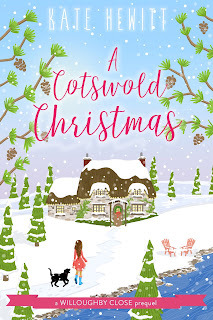 Most of my books are set in places I've lived, whether it's my women's fiction such as This Fragile Life (set in New York), my Tales From Goswell series (set in Cumbria) or one of my Christmas novellas such as A Yorkshire Christmas (set--well I'm sure you can guess). Next month I have a new series coming out set in the English Cotswolds. I only lived there for a year but I was inspired to write about the beautiful village and countryside where I lived, as well as the interesting mix of people--London transplants and old farming families, and how they all managed to get along. A Cotswold Christmas is the first book in what is The Willoughby Close series, set in the entirely-fictional-but-a-little-bit-based-on-reality village, Wychwood-on-Lea. You can preorder it here. Thanks Penny! We are enjoying exploring it! I love following your moving adventures Kate. You've lived in many places I've wanted to visit, particularly in the U.K. Nice to see you getting settled in Wales. As a side note, I received a survey recently from a large book publisher. One of the questions was who's my favorite fiction author. I said Kate Hewitt. ( : Please keep writing these stories that I love. All the best to you.